I call Bruce Brakenhoff Jr at Perini Navi USA who tells me that the price of Perini Navi's 45.26m sailing yacht Helios has been cut by €3 million. A joint central agency for sale with Bill Sanderson at Camper & Nicholsons in Palm Beach, _Helios _was built in 2007 to a Ron Holland design and is ABS classed and MCA compliant, accommodating up to 13 guests in a master, double and two twins plus five Pullman berths. 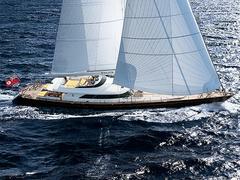 Previously priced at €20.9 million, she's now asking €17.9 million as Bruce says, "The owner is a very serious seller, now waiting to build his next Perini."